JEXPO 2019 : The Exam will be conducted to provide admission to the various diploma courses in engineering/ technology/ architecture in polytechnic colleges/institution located in West Bengal. Latest Update: The revised examination date for JEXPO & VOCLET is 30th May 2019 (Time will remain the same). Check the Procedure and Eligibility Below. Latest Update: Application for JEXPO-2019 and VOCLET-2019 has been further extended upto 18th April, 2019 (both Online & OMR). Latest Update: JEXPO 2019 Application Form Filling Procedure Started Now. Check the Procedure and Eligibility Below. Latest Update: JEXPO / VOCLET 2019 Notification with Schedule released!! Check the table below. 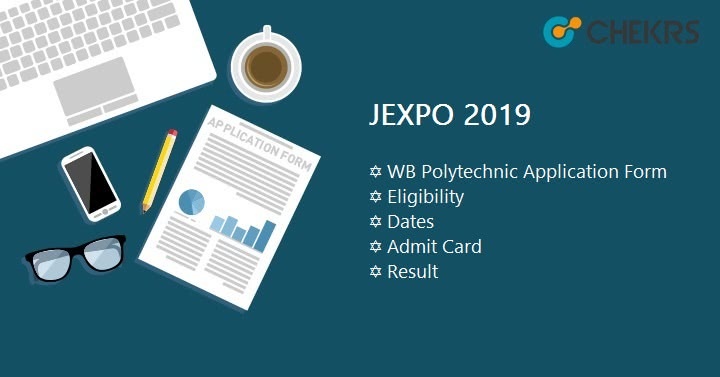 JEXPO stands for Joint Entrance Examination for Polytechnic Courses is also known as WB Polytechnic exam. it is organized by the West Bengal State Council of Technical Education. In this All in One Article We are providing all the information about the Exam, JEXPO/ WB Polytechnic Application Form, dates, syllabus, and counselling. We are Providing here some of the eligibility criteria and candidates have to satisfy these Criteria to appear in the JEXPO 2019. All the Candidates must be an Indian citizen. Candidates must score 35% marks in aggregate in qualifying exam. There is no maximum age limit to appear in the exam. But candidate should not be born after 1 July 2004. Due to Panchayat General Election 2018, JEXPO-2018 Examinations are rescheduled, But We are providing here tentative JEXPO 2019 Schedule. This table is based on previous years schedule. And we will update it when the Official-Confirmed schedule will be released. The Application Form is expected to be available in the last week of January 2019.The Application Fee will be Paid only in cash, but the JEXPO Registration Form/ Application Form will be available in Online and offline mode. We are providing steps to fill the application form via both modes. Register your self by filling personal, contact, qualifying exam, etc details in the required field. Now choose the password. Read the instructions carefully. Then Candidates have to upload the scanned photograph, signature & left-hand thumb impression in the prescribed format. After Uploading All these details, review your filled-in details, and Click on the submit button. After clicking on Submit Button, Take two print out. After it, candidates have to visit any polytechnic college to pay the Application fee in CASH and submit the Application Form. In Offline Mode Candidates have to obtain the JEXPO/ WB Polytechnic Application Form from any Governments, Government sponsored or self-financed polytechnics affiliated to the WBSCT & VE & SD [Erstwhile WBSCTE] colleges /institute in West Bengal. They must have to carry their Aadhar card there. Fill personal, contact, qualifying exam, etc details in the required field. Affix the Photographs, Do signature and give your left-hand thumb impression on the Form. The JEXPO 2019 syllabus will be comprised of class 10th Mathematics and Physical Science subjects. The Syllabus will contain every single topics & chapter of class 10th Subjects. After Filling the Application form candidates will start their preparations. So we are providing here JEXPO 2019 Exam Pattern. Plan your strategy Be Determined and Focused, Manage the time. Cover the entire syllabus, and divide the syllabus into easy and hard topics. Practice by writing which will help you to remember for a long time. Take care of your speed. Take 10-15 minutes break between study. Eat and drink water well to stay healthy. The JEXPO Hall Ticked Will be available in the 1st week of April 2019. All the candidates can download the Admit card from the official website. Candidates have to take a print out of the Admit card because they will need it at the examination center. The Admit card will be also required at the time of admission. The Result of JEXPO 2019 will be declared in the third week of May 2019 by the exam authority. The JEXPO 2019 Result will be released online on the official website. Candidates can access the result by visiting the website and login. Only those candidates will be passed in the exam who obtained marks more than the Cut-Off Marks. On the Basis of Result and CUt-Off Marks, a merit list will be also released on the Official Website. After the declaration of Result Cut-Off will be announced and on the basis of the Cut-Off Marks the JEXPO Merit List 2019 will be prepared. The Merit list will be released online on the official website. The Merit list will have names and Roll number of the students who qualified the Exam by obtaining marks more than WB Polytechnic Cut-Off Marks. On the basis of the Merit List, candidates will be called for the counseling procedure. Candidates will be called for the Jexpo Counseling Procedure after the result declaration and release of Merit List. The Counselling will be started from the 1st week of June 2019. The JEXPO 2019 Counselling will be organized through online mode. In the counselling procedure, candidates have to fill choices of colleges & courses as per their preferences. Their Documents will be verified in the counseling before the admission. After completing the counselling Procedure Qualified Candidates will get admission to all the Polytechnics/Technological Institutions in the state West Bengal.